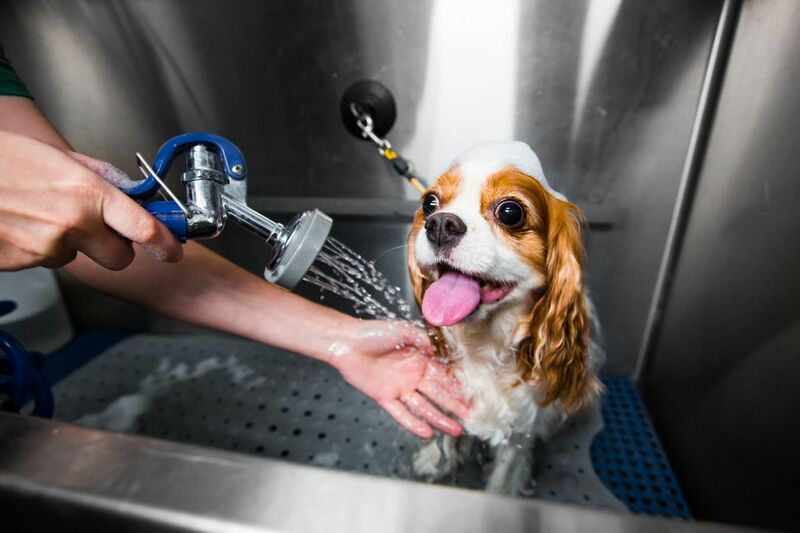 Bathing your dog is a regular grooming practice that will keep your dog's coat clean and healthy, and remove dirt, parasites, or other elements that can get stuck in the fur. While dogs don't need daily bathing, their fur, environment, and other factors can impact how often to bathe them. Speak to your vet to know how often your dog should be washed. Proper preparation can make the bathing process easier for you and your dog. A tub is usually the easiest place to bathe your dog, though very small dogs may be bathed in a sink. If you will be using your tub at home, it might take a toll on your back and knees and leave a mess to clean up. Some pet supply stores offer self-service dog wash tubs you can use for a small fee. It's less expensive than paying for a groomer and you can avoid a mess in your house. If you choose to bathe your dog outside, remember that cold water is no fun for most dogs. In addition, cold water will also not clean your dog as well. Make sure the weather is warm so your dog doesn't get too cold, or use heated water so your dog can get a nice warm bath. If you pay for the use of a self-service dog wash, these supplies may be ready and available for your use. If you bathe your dog at home, be sure to gather your supplies in advance so you don't have to scramble for things later. Brush your dog out before you start the bath. Be sure to remove any tangles or mats as these are harder to deal with once your dog is wet. Then apply a strip of artificial tears ointment or a few drops of mineral oil to each eye. This will help protect the eyes from shampoo. Soak your dog from head to toe with warm water. This works best if using a hand-held sprayer, but you can also pour water from a pitcher or bucket. Always test the temperature on your arm before putting it on your dog. Many dogs have water-resistant coats, so a thorough soaking is usually necessary to penetrate the hair. Be sure to avoid the eyes and inside of the ears. 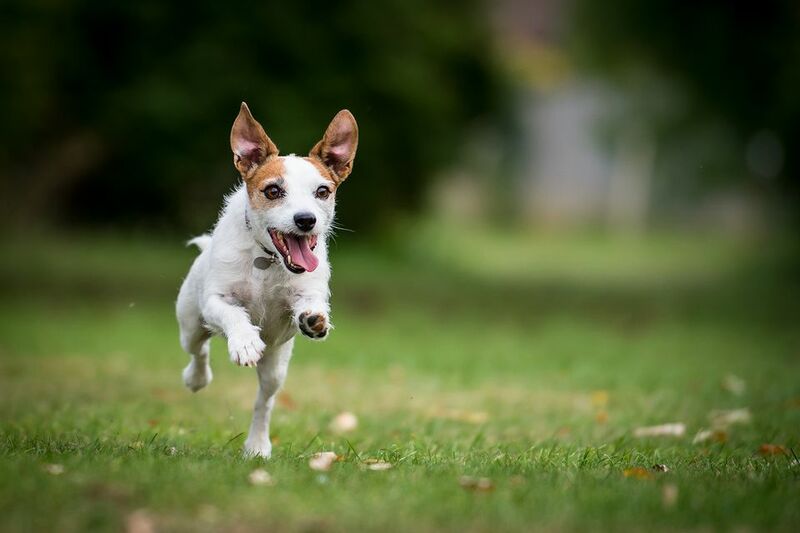 Your dog will instinctively want to shake the water off. Keeping a hand on the top your dog's head may help prevent this. Apply shampoo to your dog's coat. Avoid the eyes, face, and genital area. Use enough shampoo to create a lather. Apply small amounts of shampoo at a time to avoid using too much. One option is to mix two parts shampoo with one part water so that a more liberal amount can be applied. Add the mixture to a spray bottle or a large plastic cup for easier application. Remember to use caution around the face and eyes. Rub, scrub, and massage your dog for several minutes. You can use your fingers, just like shampooing your own hair. Your dog will probably actually enjoy this part. Remember to clean the feet, too. Ideally, you should allow the shampoo to remain on your dog's coat for 10 to 15 minutes before rinsing, especially if it's medicated shampoo. Take this time to clean your dog's ears. You can also use a rubber or plastic dog scrubbing tool with small nubs made especially for bathing a dog. It provides an extra massage for your dog's skin and helps lather up the shampoo. Apply a stream of water to your dog's coat, avoiding the eyes and ears. Thoroughly rinse all shampoo out of your dog's coat. A shower sprayer works best for this; rinsing with a cup, pitcher, or bucket will take longer. Remember to thoroughly rinse the feet and any skin folds or crevices on your dog. It is very important to remove all shampoo residue from your dog. After initially rinsing your dog with warm/hot water, use lukewarm or slightly cool water to help remove shampoo residue and close pores. First, stand back and let your dog have a few good shakes. Then, towel-dry any excess water from your dog's coat. Lay a towel on the ground and let your dog go for it. Many dogs will instinctively rub on the towel and continue to shake off the water. Then, you can follow with some more towel-drying. If your dog tolerates it, you may want to try blow-drying. Be sure to use a dryer with very low or no heat. If you bathe your dog at a self-service tub, a forced-air dryer might be available. Careful, these dryers are powerful. Only turn it up as high as your dog tolerates, and stay away from the face, eyes, and ears. Once your dog is completely dry, thoroughly brush out the coat. Wipe any greasy film from around your dog's eyes with a damp cloth. Try to keep your dog from going outside until dry, otherwise, you'll have a dirty dog again in no time. Some dogs may just absolutely hate the bath. It may feel like a wrestling match or be so messy and time consuming that you want to give up. If this is the case, it may be time to visit a groomer. Professional groomers are recommended for certain breeds that have long hair that needs regular clipping. If you are determined to give at home baths, keep trying and arm yourself with dog treats.